The Samsung Galaxy S6 edge is a technological beauty encased in glass featuring the world&apos;s first dual curve display screen and also won the best phone award by Tech radar 2015. It has storage sizes ranging from 32gb to 128gb. However, while this phone may entice you, it may also burn a hole or two in your pocket. A great mobile phone and truly worth of money. It is a good looking phone with some features complementing its looks. I am a big fan of it&apos;s display quality and visual experience. Moreover, I am just a big fan of it&apos;s camera quality and capturing speeds. Do buy this phone if it suits your budget. The S6 Edge is a fantastic looking handset with plenty of power and an impressive camera, but a high price, poor battery performance and sub-par edge screen features stop it from achieving perfection.The Samsung Galaxy S6 Edge is also smart lock enabled. The camera lens is in a good location on the rear of the handset . 10 Pricebaba users have written their experience with Samsung Galaxy S6 Edge. 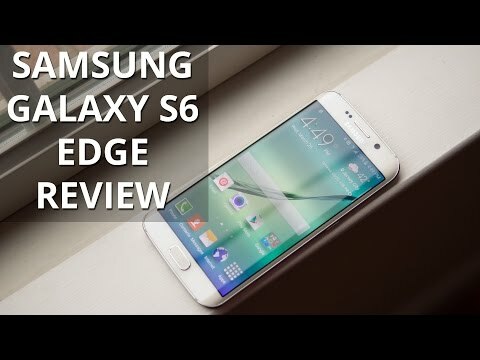 If you own Samsung Galaxy S6 Edge, please do leave your feedback too. Lowest price of Samsung Galaxy S6 Edge price in India starts at Rs. 37,299 Samsung Galaxy S6 Edge is available on Flipkart at Rs. 37,299 and on Amazon at Rs. 41,310. Prices updated on 25th April 2019. Last years Galaxy S5 wasnt quite successful for Samsung as the smartphone received lot of flak for its repetitive, plasticky body-design and uninspiring software filled with bloatware. This year the company is back with not just one but two models -- Galaxy S6 and Galaxy S6 Edge. Although almost identical, the Galaxy S6 Edge sets itself apart from the S6 with its eye-catching dual-edge, slightly curved display on both the front sides. Weve seen such a curved display earlier on the Note Edge by Samsung. 5.1-inch Quad HD (2560 x 1440 pixel) Super AMOLED display, that takes the pixel density to a mind-boggling 577PPI. It is protected by the new Cornings Gorilla Glass 4 on front and back. The curved edge display helps for easier swiping across the screen and get light-up with distinct colors for notifications of your favorite contacts. Octa-core processor (2.1GHz Quad-core Cortex-A57 and 1.5GHz Quad-core Cortex-A53); Exynos 7420 chipset (64-bit) with 14nm architecture and 3GB DDR4 RAM. Theres no microSD card slot and its available in 32GB / 64GB / 128GB variants. A non-removable 2600mAh battery is packed in and support for both Qi & PMA Wireless Charging is present. The phone also has fast USB charging which Samsung claims is 1.5 times faster than the Galaxy S5, providing about 4 hours of usage after only 10 minutes of charging. It comes with UFS 2.0 flash memory which provides higher performance and enhanced memory speed with lower power consumption. For the first time, theres a f/1.9 lens on both front (5MP, 120 degree wide-angle) and rear (16MP) cameras. The camera can be quickly accessed by simply double clicking the home key button. The camera supports Auto Real-time High Dynamic Range (HDR), Smart Optical Image Stabilization (OIS) and IR Detect White Balance. For video recording, the camera can record 4K (2160p) at 30fps, 1080p at 60fps, and 720p@120fps. The phone comes with a new fingerprint sensor in the home button that no longer requires a swipe and also an infrared heart-rate monitor sitting besides the rear camera. On the connectivity front, the Galaxy S6 comes with WiFi: 802.11 a/b/g/n/ac (2.4/5GHz), Wi-Fi Direct, Bluetooth®: v4.1, USB 2.0, NFC, IR Remote and supports VoLTE as well. The phone runs on Android 5.0.2 Lollipop with Samsungs toned down version of TouchWiz and useful features like Ultra Power Saving Mode, Samsung Pay, and Microsoft Apps (OneDrive 115GB storage for 2 years). The company has also introduced Samsung Pay with the Galaxy S6, a new mobile payment service but its only in the United States for now. It works with both Near Field Communication (NFC) and Magnetic Secure Transmission (MST) technology. Its available in White Pearl, Black Sapphire, Gold Platinum, Blue Topaz and Green Emerald colours.